“Oh my gosh, Jimmy!” Jean Engel screamed, grabbing frantically at her shirt. She had been in the kitchen trying to get a griddle down from a cabinet when something fell on her. Now it was inside her shirt, somewhere on her chest. “Aahh!” she screamed, trying to get her shirt off. “Don’t slap it. That’ll make it bite. Here, let me help.” He quickly pulled the bottom edge of her pullover shirt out of her pants and started shaking it, trying to dislodge the spider. Jimmy grabbed the front side of her shirt, shaking it violently. A brown spider about the size of a quarter dropped to the floor and scurried toward the baseboard. “There it goes!” Jimmy darted after it, stomping furiously. The spider disappeared into a crack. While she left to go to the bedroom, Jimmy considered their situation. He and Jean had moved to Craven, Tenn., so he could attend graduate school at a local college. They hadn’t known a baby was on the way, which now was complicating their plans in many ways. They were living on nothing but student loans and Jean’s part-time work at a local supermarket, so they had been forced to rent a run-down, 60-year-old concrete block house at the edge of town. Ever since moving into the house, they had seen numerous spiders of all sizes. The place seemed totally infested. But what could they do about it now? They had signed a lease, and the landlord didn’t seem too concerned. And what about baby Molly? Was she really in danger of being bitten? Crawley had met MJ after work for a drink at her Uncle Kelly’s pub. The small-town Tennessee atmosphere wasn’t very receptive to a Boston-style pub, but her Uncle Kelly’s infectious personality and persistence had managed to keep it in business for over a decade. “I always dreamed of going to the Mississippi State University, ’cause my cousin went down there, but my folks couldn’t afford no big college like that. So I started out at the local community college, but didn’t get very far. Had to drop out.” He nervously nudged his glasses up his nose. “The mountains …” MJ began, but stopped when she saw Crawley’s wistful look. The next morning, Crawley and MJ made their way through miles of farms and pastureland toward the Engel place out on the south edge of Craven, Tenn. The October landscape was beautiful, and dotted with numerous mature cotton fields and patches of yellow- and red-clad trees. When they arrived, they found the house to be a small, flat-roof concrete block structure situated in a patch of large pine trees. It was clearly run-down and in disrepair. Several inches of pine needles and other debris littered the roof, and all manner of junk, old tires and roofing material lay scattered around the yard. That’s not all you need. Crawley’s eyes roved around the property, instantly assessing all the potential insect breeding and harborage sites. He fought back the urge to start cleaning up the yard. “Any idea what kind?” MJ asked. Once inside, Crawley went toward the living room, where he noticed the walls were lined with old and peeling wallpaper with a faded floral pattern. It looked like something right out of the 1960s. He reached for an edge of the wallpaper next to a window and peeled it back another inch or so. He immediately noticed several molted skins of small spiders about as big as a dime. Crawley leaned over for a closer look. Uh-oh, could it be? Then he turned his attention to a stack of old newspapers and magazines beside the fireplace. He began to slowly move the papers aside, looking for spiders hiding in them. A quarter-sized brown spider scurried out of the pile and disappeared behind the curtains. Crawley eased over to the curtains and gently pulled them back. He saw a few spots of loosely spun, indistinct white webbing attached to the backside of the curtains. Just then, two adult brown spiders dropped to the floor from the curtains and disappeared into cracks between the bricks on the hearth. 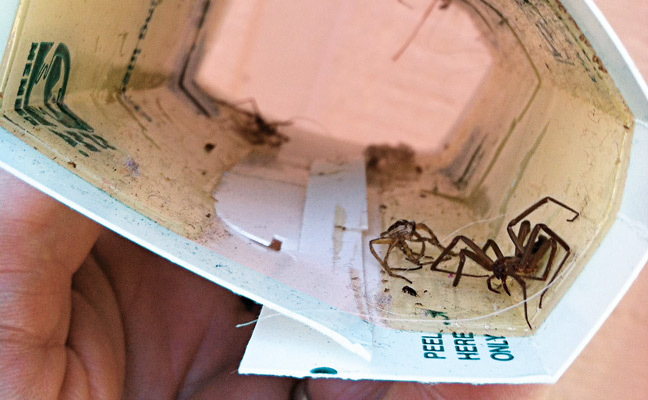 When he spotted them, he knew what they resembled, at least from a distance: brown recluses! He continued the inspection in the other rooms of the house. 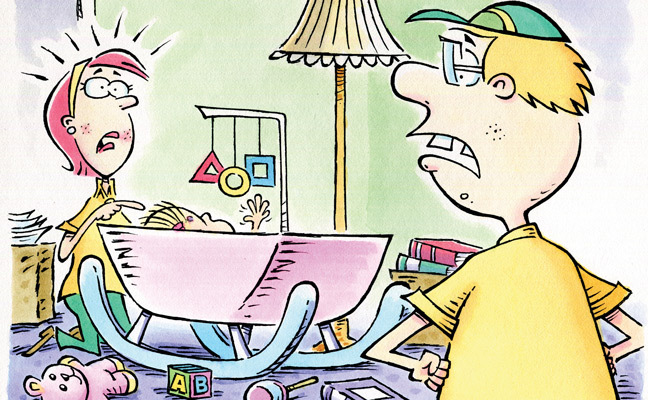 When he got to the bedroom, he found a bassinet positioned by an old, lumpy queen-sized mattress lying directly on the floor — no bed frame, no nothing. There was a huge mound of what looked like photocopies of science papers on the left side of the mattress. Crawley stealthily made his way around the room, looking for spiders under and behind anything he could move. He counted six more spiders behind pictures on the wall, and three hiding in the stack of science papers. One of them stood still long enough for him to see the fiddle-shaped marking on its cephalothorax, thus confirming the identification. “Yep, we gotta be careful here. Especially what we say to them.” He paused a long time, thinking deeply. “Let’s talk to the guy and set up a control plan. There are some things they’re gonna have to do, like clean up this junk and clutter. Then we can set out sticky traps to both monitor the spiders and catch a bunch of them. Every single piece of furniture, every box, every container in this house is gonna have to be carefully inspected for the spiders — and maybe vacuumed out. Then me and you can put out a pyrethroid dust in cracks and tight places around the house and also spray with a good residual. Back out in the living room, MJ and Crawley discussed in detail their findings with Jimmy, and their plan to get rid of the spider infestation. He nodded, but seemed irritated when MJ got to the part about how the Engels would need to participate in the pest control process by cleaning up the junk and clutter. It took MJ and Crawley a full two hours to fight their way through all the junk and clutter in the small house to place 48 sticky traps and treat as many cracks and crevices as they could find. Upon leaving, they told Jimmy they would be back to check the traps and treat more thoroughly in a few days. “I don’t know if that’s enough this time,” he said softly, turning to face the window. 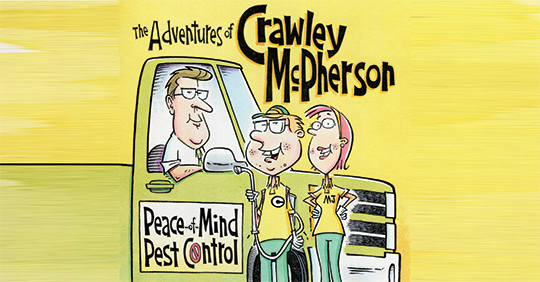 Five days later, Crawley and MJ returned to the Engel place to check their sticky traps and make more residual insecticide applications for brown recluse spiders. Of course, this would depend on whether the family had cleaned up the clutter and junk in their house to make that possible. Jimmy Engel ushered them into the home. After he introduced them to Jean, MJ went straight for Molly, who was lying in the baby sleeper chair in the middle of the living room floor. “Ooohh, what a cute baby,” she cooed, kneeling down. Crawley stood by awkwardly, waiting for MJ to get finished conversing with the baby. He looked around the room and his heart sank. It looked exactly like it had the last time! They ain’t done one thing we asked. Then he noticed MJ was examining a reddish-blue, swollen spot about the size of a dime on the baby’s forehead, at the edge of the hairline. She looked up at Crawley with grave concern written all over her face. She nodded toward the baby. “C’mon, Crawley. Don’t you want to come meet baby Molly?” Then she nodded again toward the baby, as if signaling him. He guessed she really wanted him to look at the wound on the baby’s head. But he didn’t need to — he already knew what it was — a brown recluse spider bite! He fought back the urge to cuss, or scream, or something. That spot might spread to be as big as a half-dollar and eat away half her face. “Nope.” He walked to the door. “We’ll ask the landlord to get someone else.” With that, he shooed them out and slammed the door behind them. On the way out to the truck, MJ noticed Crawley wouldn’t even look up enough to see where he was going. He just stumbled along, stunned, or crying, or both. Then she saw him retrieve a small necklace from his pocket and clutch it to his chest. He stood still, but wouldn’t meet her eyes. He stuffed the necklace back in his pocket. After that comment, MJ and Crawley made the 45-minute drive back to town in almost complete silence. They had indeed learned a hard lesson today.